I don’t think anyone would ever mistake me for a ‘girly-girl’. I would much rather sleep-in than bother blow drying and styling my hair in the morning, and while I do wear makeup to work, it’s limited to powder, eyeliner, blush and mascara. I have one perfume that I wear every day, and I generally wear the same limited jewellery – watch, pearl stud earrings, and my right hand ring that I bought myself after landing my first ‘real’ job. Having said all that, the storage requirements for my limited girl-stuff is quite small. I use the drawer in the shelf I built in my bathroom for my makeup, and I keep my jewellery and perfume in my room atop my dresser (even I know you shouldn’t keep perfume in a hot and humid bathroom). This system worked fine for years until I got the brilliant idea to upgrade my dresser from my childhood Ikea dresser to the vintage wood dresser I refinished early this year. What was I thinking? I spend so long working on that dresser that when I went to go put my perfume atop my dresser couldn’t do it. What happened if the perfume leaked? As most perfumes contain alcohol it might damage the carefully applied finish that I laboured over for hours. 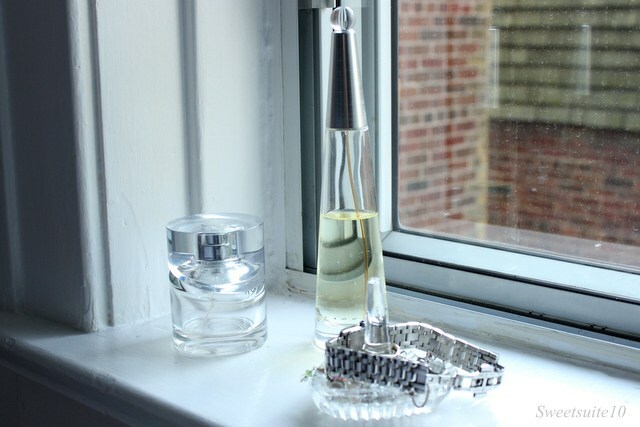 So, the perfume and jewellery ended up sitting on my window sill for months while I tried to figure out what else to do. Yup, that’s right. I already owned the perfect silver tray. I inherited this little set when my parents sold my childhood home, and moved across the country. It’s not a family heirloom – my mom bought it at a thrift store. So here it sits, atop my dresser keeping my perfume and jewelry corralled. Now I just need to find uses for the little sugar and creamer that came with the tray – they’ve gone back into the cabinet to be rediscovered at a later date. Have you recently discovered something in your home that you forgot you had? Have you put it to good use? Funny, I just did a similar thing with an old coffee set from my mom. I didn't pay much attention to it until I realized I might actually like it if I saw it in a thrift store! So now it's sitting out on display on a sideboard - and it looks great! Who new??? I have a pic up on the blog http://lifeovereasy.com/2012/05/sentimental-vintage/ I probably have all kinds of stuff stored away that I should really use. 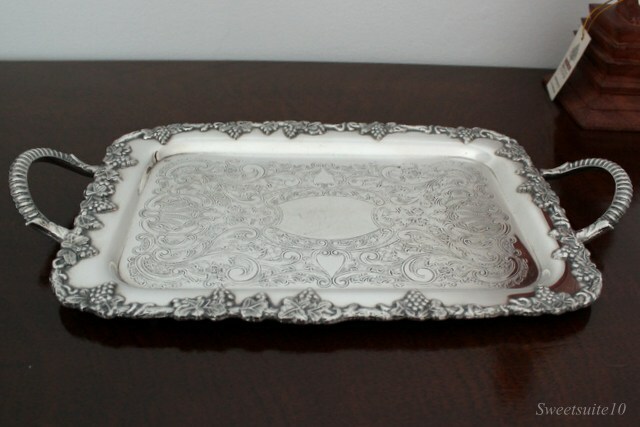 And the silver tray looks great btw! I'm so glad you are joining us for the Olympics! It's going to be great fun!! I love your tray. 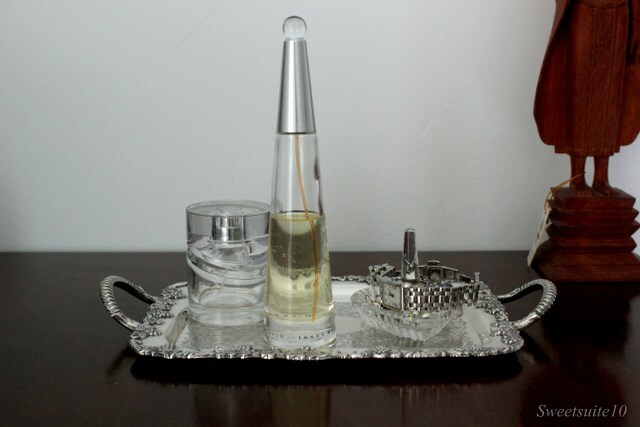 I've done similar things with a few silver trays i found at my mom's. She wasn't using them so i cleaned them up and am using both. Yours looks much cleaner than mine though....needs more elbow grease i guess! Love your idea! It looks so beautiful all polished up! 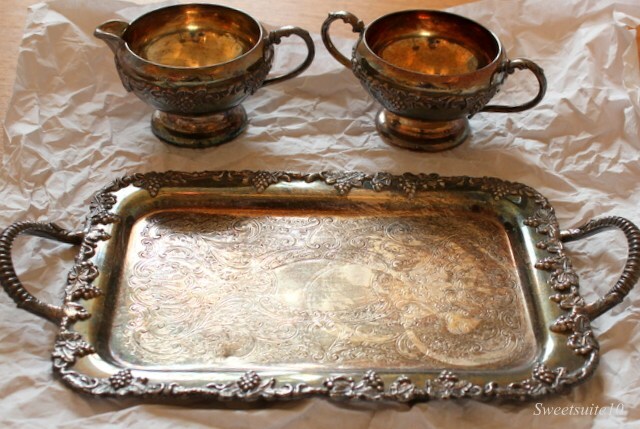 I need you come over and polish all my silver, too :-) Could you use the cream and sugar for your jewelry? Um, shall I admit that the picture was taken a while ago and it's need s little work again? That's an interesting idea, but given I don't really wear or even own much jewelry I don't need to use them right now for that.